In the past few days, Barbara Smith, the administrative assistant for A&AS has crisscrossed the area delivering much need gifts and supplies to the area’s veterans and their families in need. A GREAT BIG THANK YOU TO OUR PATIENTS FOR MAKING THESE DONATIONS POSSIBLE! A&AS would also like to thank the COLBROOKDALE POLICE DEPARTMENT SHOP WITH A COP program who donated a significant supply of goods and gifts. Donations at the first stop included baby supplies, toiletries, toys and food gift certificates for two homeless veterans and their children. 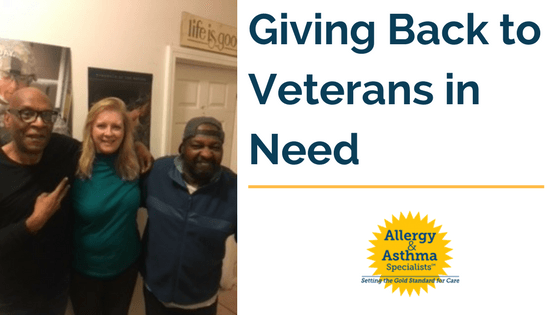 At the next visit, Barbara delivered toiletries and gifts to 4 families of women vets with 7 children in total struggling to stay in their homes. The third delivery was to a disabled veteran and his wife and 2 children. They received toiletries, a PS4 game and art supplies for the children and a selection of gift cards. At the fourth visit, Barbara delivered gifts to an 88-year-old Korean War veteran and his wife. They received a new toaster oven, new bedding and pillows, toiletries and assorted gift cards. She next visited the Horsham Naval base to meet with the group that assists Air National Guard families in need. There she donated to 3 families with 7 children clothing, holiday gifts for the children, baby supplies, toiletries and gift cards to each family. At the final stop, an SUV full of donations went to the main house of Support Homeless Veterans, Inc near Temple campus. With the help of residents, Anthony Brown and Anthony Miller (pictured with Barbara), boxes of toiletries, kitchen supplies, clothing including winter coats, towels, and gifts were unloaded.